And lo, it came to pass that on the 28th day of the 11th month of the year of our Lord Nineteen Hundred and Eighty Three, that Lord Richard of Branson did declare “Let there be pop!”, and the British music charts, and the record collections of the nations’ teenagers would never be the same again. From the first bass note of You Can’t Hurry Love, to the final “ooh” of Victims, NOW! was determined to be the definitive collection of the year’s biggest hits, and by jove, did it succeed. Glancing through the track listings of later albums in the series you often find yourself staring blank-faced at names that no longer mean anything to anyone. One hit wonders abound, and even some successful artists will elicit the question “what were we thinking?” rather than “they were great, weren’t they?” Not here. 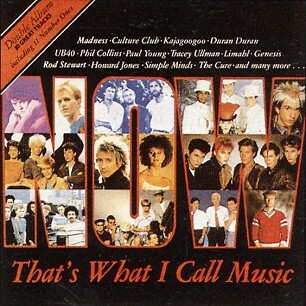 Maybe 80s stars were more hard-wearing, maybe I’m being kind to the music I grew up with, but if a contemporary compilation can hit harder than this, I’ve not found it yet: Duran Duran, Madness, Culture Club, Phil Collins, Rod Stewart, Tina Turner, Human League, The Cure, UB40… You can argue the individual merits of the artists, or the song choices included here, but you can’t deny the sheer number of pop titans in attendance here. And that’s looking at it at a remove of 30 years. Imagine how this must have seemed at the time! And looking at the track listing (at the end of this post), it’s about as close to “all killer, no filler” as you are going to get. Even the less well-remember tracks would come flooding back with a brief burst of them on the radio. Most kids of my generation would record the charts off Radio 1 on a Sunday afternoon, or at least those tracks we liked. The appearance of NOW! almost made that redundant, because they were all here. All we had to do was wait until Christmas, and, if you dropped enough hints when the advert was on the telly, someone would buy it for you (or you could always use that Crimbo money burning a hole in your pocket, and get something tangible rather than blowing the lot on Sherbet Dib Dabs). Thrilling stuff, I’m sure you’ll agree. Odd to hear Gary Crowley, a legendary alternative DJ, plugging an album of pop hits and telling people to head to Woollies to pick it up, but at the time Crowley was the youngest DJ in the country, ploughing his trade on Capital Radio in London. So he’s down with the kids, but regional? Well, no, he was also presenting a kids show on ITV (Fun Factory, not to be confused with Pat Sharpe’s Fun House), so he would have been a familiar voice. The difference in these two ads is astonishing. One is conservative, to the point; the other is fun, playful. Guess which route the advertising would take after this. The official NOW! YouTube channel (http://www.youtube.com/user/nowmusic25?feature=watch) note that the Tracey Ullman advert was the first to be shown, and the Crowley ad was second. Far be it from me to suggest the official NOW! people are wrong, but this does seem slightly odd, for a couple of reasons. The first, as stated above, is that the Crowley ad is very conservative, as if the marketing team hadn’t quite found their feet yet. Being unsure how to flog the thing, they simply got a hot DJ to reel off a list of the artists on it, with the cover featuring prominently. The Ullman advert is a lot more confident, as if the suits realised “we can have fun with this”. it also features snippets of videos, which would have required additional clearance to use in the advert, which takes time, and then right at the end, there’s mention of a video collection too (featuring 18 of the 30 tracks). Would they really have left that out of the second advert if it was available? But like I said, I’m just speculating on this, and I’m sure the young whippersnapper running the show on YouTube knows their stuff. So, back to the album. The cover design is excellent; NOW! in huge letters has obviously come to be the main focus of the albums over the years, and this was clearly an early design decision. Filling the word with pics of the biggest stars on it helps as well. Don’t forget, in 1983, NOW! didn’t mean anything to anyone, so a hook was needed to get the punters to part with their cash. And that hook, unsurprisingly, was the stars. Notice how the focus is on the artists rather than the songs. I believe this was a deliberate choice, to steer NOW! away from the murky waters of Top of the Pops and Hot Hits, who would adorn their covers with track titles, only for the unsuspecting buyer to discover they’d bought an album of session musicians knocking out chart hits at a rate of about four a day. Here, there’s no danger of being ripped off. You want the biggest chart hits by the original artists, you are going to get them. It would be a long time before a NOW! album could again boast eleven (11!!!) number one singles. They were so proud of the fact that inside they list the other, unfortunate number ones that didn’t make the cut, all 5 of them: Billie Jean (Michael Jackson), Let’s Dance (David Bowie), True (Spandau Ballet), Every Breath You Take (The Police) and Uptown Girl (Billy Joel). There was a sixth, Only You by the Flying Pickets which reached number 1 after NOW!’s release. It’s easy to speculate on why these would be excluded over say two UB40 tracks, but these were all successful and more importantly POWERFUL artists (with the exception of Spandau Ballet) who didn’t need, and probably didn’t WANT to appear on a compilation album. Jackson and Sting would only ever appear on one NOW! album each, whilst Spandau Ballet and Billy Joel would never appear. Being as their respective record companies were happy to license other artists to appear (for instance Jackson’s Epic Records was also home to KC and the Sunshine Band) you have to assume it was the artist, or more likely his representatives, choosing not to appear. Bowie is an odd one. He was signed to EMI, so contractually there was probably no reason why Let’s Dance couldn’t appear. It was a huge hit, so surely NOW! would have wanted it to be included. The fact that Bowie tracks would appear regularly throughout the 80s further adds to the mystery. If all this seems unnecessarily trivial, well, you’ve got NOW! to blame for that, thanks to their decision to include a snippet of trivia about each track on the inside of the sleeve. Open up that sumptuous gatefold (along with b-side, another phrase at least two generations will never use) and you’ll find a wealth of pop facts like Mike Oldfield’s Moonlight Shadow reached number 4 on June 29th and stayed there for 3 weeks. Or that Duran Duran’s Is There Something I Should Know was only available on this album (and this single version would remain so until the release of Decade, in 1989). Or best of all that Victims by Culture Club was “Almost certain to be No.1 by the time you have this LP” (would you settle for number 3?). Alongside these nuggets would be the name of the album the song came from, just to try and get a few more pennies out of the kids. How this inclusion came about, I’m not sure, but somewhere between NOW! and NOW 2, a change came about and a handy compilation of the biggest tracks of the year added the opportunity for EMI and Virgin to start plugging artists that maybe needed a little extra push. The seeds are here with the inclusion of Waterfront by Simple Minds. The little blurb is notable for its brevity “Released from forthcoming LP & cassette” (sic). No mention of chart placing, no mention of an album title… nothing. And this wasn’t included in the anticipation of it being a hit as they had done with Victims. At this point Simple Minds had had only two top 20 hits, and were knocking on the door of success, but by no means breaking it down. Was the inclusion of Waterfront in such distinguished company an attempt to get some of the success sparkle of Culture Club, Duran Duran and Kajagoogoo to float their way? Kajagoogoo are an interesting bunch, even more so in their relation to NOW! Famous these days for one song, and one song only, Too Shy (here as Side 2, Track 3), just as they seemed destined for greatness, lead singer Limahl jumped ship and enjoyed a brief spurt of success on his own, whilst the Kaja’s themselves bravely carried on in the face of public indifference, before finally the public decided they didn’t really like either the group or Limahl and his stupid Crufts-winning haircut. On NOW!, the collective of Kajagoogoo make up 3 tracks! That’s 10% of the album! (This kind of dominance would not be seen again until the various Spice Girls ruled the world, fleetingly, at the turn of the millennium. ) 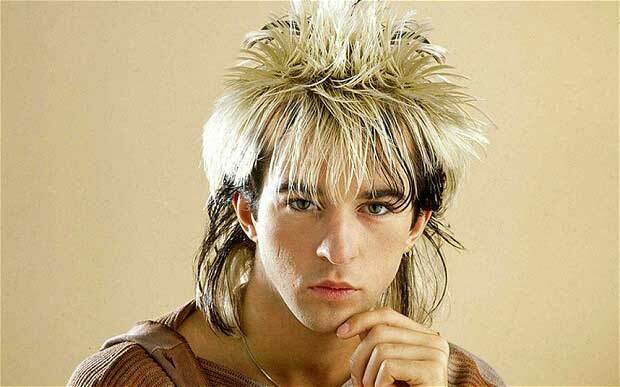 So, alongside Too Shy, there’s Limahl’s first solo effort, the long-forgotten Only For Love, which reached the dizzy heights of number 16 (but in fairness was climbing the charts well at the time of NOW!’s release; this was back in the day when records took time to find an audience and could take weeks to reach their highest chart position) as well as the post-Limahl Kajagoogoo’s first release, the rather bland Big Apple, which would trump Limahl by at least going top 10 (the dumper would beckon soon afterwards). Multiple appearances by artists on a NOW! are not unknown, but are still relatively rare. NOW! 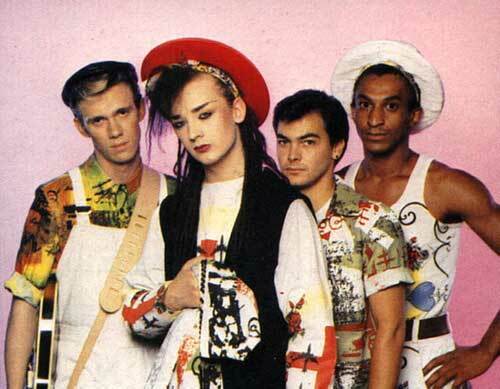 would feature 4 multiple appearances: the aforementioned Kajagoogoo/Limahl, as well as Phil Collins (solo and with Genesis), Culture Club and UB40. 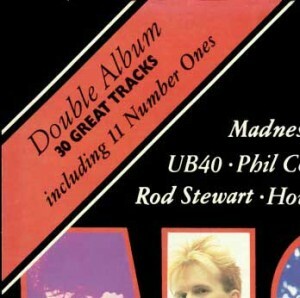 In future cases, multiples would generally occur when an artist has two massive hits in separate guises (usually as a solo artist, and another with a group or a duet), so the double bubbles here of UB40 and Culture Club are very unusual, and would suggest either last-minute filler (possibly for the number one’s listed above that they couldn’t get) or bigger attempts to plug the artists’ albums. 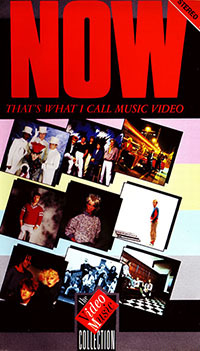 The video version released at the same time contained 21 tracks, including 3 which didn’t feature on the actual album: IOU by Freeez, Never Never by The Assembly and Hold Me Now by The Thompson Twins, which did appear on Now 2. Although I was happy with “Now 1” at the time – it really was head and shoulders above the Ronco, K-Tel and Telstar offerings I’d been snapping up greedily prior to the birth of “Now” – this inaugural edition seemed to lack character for some reason. Maybe it’s because this one didn’t possess the “magic touch” of its powerhouse compiler Ashley Abram (not that we were aware of this at the time), or maybe it’s the lack of obscure flops which I had become so used to discovering via these quarterly TV-advertised compilations – sometimes these would present real gems: that year’s “Chart Encounters Of The Hit Kind” (!!!) from Ronco introduced me to the sublime Louise Tucker’s “Midnight Blue” (a no. 46 “hit” I think)… I think “Now 1” spoilt us with these overplayed 11 number ones! I think my main reason for not taking “Now 1” to my heart as much as I should have is because it is essentially an overview of 1983 rather than focusing on a specific third of the year. The “10th Anniversary” series and later the “Millennium Editions” also seemed to lack the pizazz of the regular series and I think this is due to the wide casting of the net in terms of track selections. Give me “Kissing With Confidence,” “The Love Cats,” “The Sun And The Rain,” even – eek! – “That’s All” over any of those 11 number ones (just not “Only For Love”!! – which always was, and still is, awful). I felt that way then and still think the same now. Classics though they all are in their own way I’ve just heard those tunes too many times! I think you’ve nailed it. I bought this record on 8 December 1983 so logically it should be “the most special one”. For some reason it isn’t despite a great track selection. It’s definitely got that overview feel – given the number of tracks that date from the earlier part of the year. The CD reissue is disappointing – the versions of Only For Love and Double Dutch are different. This does not inspire me with confidence for further reissues of Now 2 – 9. A case of not going back to the original master tapes. I don’t like the sound quality of the Millennium Editions but those 10th Anniversary sets are very enjoyable – particularly the 1983 – 1985 ones. You get a lot of tracks that appeared on the first half-dozen Nows in decent uncompressed CD quality. 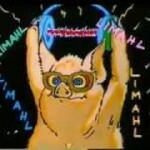 Back in 1993 the Loudness Wars didn’t exist. Spandau Ballet – True and Eurythmics – Sweet Dreams ended up on Now 10th Anniversary 1983. This also included the three VHS orphans [Hold Me Now, Never Never and IOU]. David Bowie – Let’s Dance and New Order – Blue Monday are on the Now Millennium Series 1983. “For information only – these were the other number ones of 1983”. I’ve already dealt with True and Let’s Dance. The Police – Every Breath You Take. See Now 10th Anniversary 1983. Billy Joel – Uptown Girl. Now Millennium Series 1983 is your friend. Michael Jackson – Billie Jean. Finally made it – Now 30 Years.